To get Wicker Park excited about another coffee shop, you’d have to do something pretty crazy. Like, say, install a DeLorean in the front of the store. Okay, Wormhole, you win. So now that this time-travel-themed coffee shop has the neighborhood’s attention, what else is going on here? A small selection of baked goods from Fritz Pastry (including doughnuts! ); Cheerios and other assorted cereals; and some very serious baristas, who use beans from a variety of cult roasters and who cold-brew the strongest iced coffee that’s ever graced our parched, caffeine-starved lips. El stop: Blue to Damen. Bus: 50, 56, 72. The Wormhole is easily one of the most eclectic coffee shops in the city. Its the perfect place to grab a cup of quality coffee with friends or semi-hibernate there for studying/working on your laptop. My favorite go-to drink is their honey bear latte or for a nice day outside i go for their hibiscus iced tea. Yes it may be on the slightly pricier side than compared to other coffee joints, but the quality of each drink speaks for themselves. Its super accessible to the blue line as well in case you needed to make a quick coffee and donut run before heading to work. 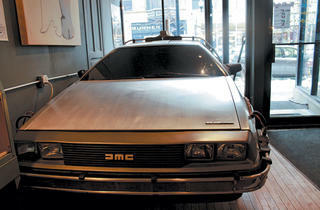 Added cool points that they have a replica of the DeLorean from Back to the Future inside. Overall, if you were to go to any coffee shop in the city, this would definitely be in my top 3. The Wormhole is such a neat place to hang out! I was meeting up with friends for a quick cup of Joe and it was perfect. I love that they have couches and comfy lounge chairs. Perfect spot for studying or socializing. My only complaint is their prices. I paid $5 for a cup of coffee... Don't get me wrong, it was delicious. I'm just not sure it was $5 worth of delicious (is any cup of coffee really?) Price aside, it was a great experience. Try the Bone Apple Tea! Vegan baked goods I'd offer a blood sacrifice for, fun atmosphere and oh so tasty drinks. The Peanut Butter Koopa Trooper is all I need! Plus they have a lot of geek culture in their cafe! Always a plus! Fantastic venue, awesome decor and the coffee drinks, made with HalfWit Coffee, are the best in the city! Well-played, WormHole! Best Coffee shop in Chicago. Huge 80s fan. The Wormhole is a terrible place for me to get work done, because it is just so freaking interesting and filled with neat things that make an already distractible person very off task. I love coming to this lively Wicker Park coffee shop with friends for an afternoon or late into the night, since this spot is one of the few with wonderfully late hours. Come here to nerd out and perk up. The Wormhole is a just plain cool spot in Wicker Park. 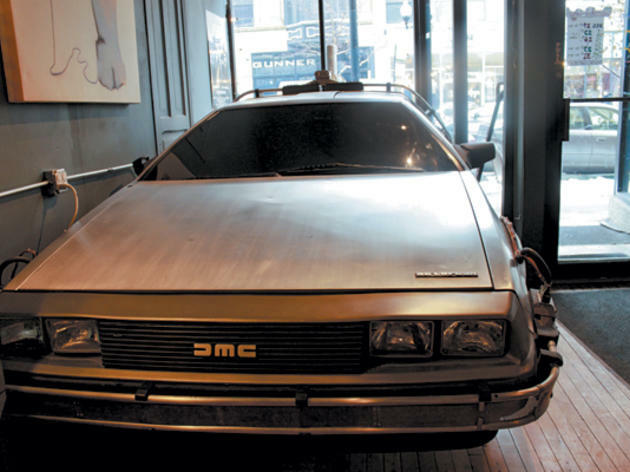 This blast from the past coffee shop even has a Delorean in its space! It's a very fun place to pop in with a friend visiting from out of town and in need of a bad caffeine fix, but it's also great if you just want a change of scenery and want to sit and get some work done in a more interesting atmosphere. It's fun simply even to look around in here, as you'll see Gizmo, Dr. Mario, and all your favorites from the '80s hanging out. And of course, they have great drinks!